As it’s St George’s Day, it seems right to show something with a bit of style, appropriate to the day. Unfortunately, nothing with the St George’s flag on it is remotely cool – except perhaps this rather nice Café Retro coffee maker from Kenwood. Those who don’t like the "flag" design will be pleased to know that the machine comes in a selection of plain colours. As a coffee maker, there a 15 bar pressure to ensure high quality espresso and an adjustable steam frother froths milk easily and conveniently if you fancy a cappuccino. There’s also an integral cup warmer that heats cups before serving. Nice touch. 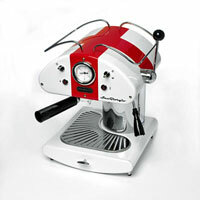 The Kenwood Café retro espresso machine is available now for around £180. I’ve had one of these for a couple years now (minus the flag) and can confirm it makes great espresso (especially Illy ) but not so grat for cappuccino.